Beetroot is very sweet so it needs something tart, hence the Bramley apples. The slightly sour, farmyardy flavour of goat’s cheese is perfect against that sweetness and completely elevates an inexpensive soup (just look at the beauty of it for a start). A swirl of soured cream or Greek yogurt and a scattering of dill is lovely too, though. You can also serve this hot. Melt the butter in a large, heavy-bottomed saucepan and add the onions, carrots, celery and garlic. Add a splash of water, cover and sweat for 15 minutes until the onions are soft. Add the beetroot (I don’t bother to peel it) and apple, cover and sweat for 15 minutes. Pour on the stock and season. 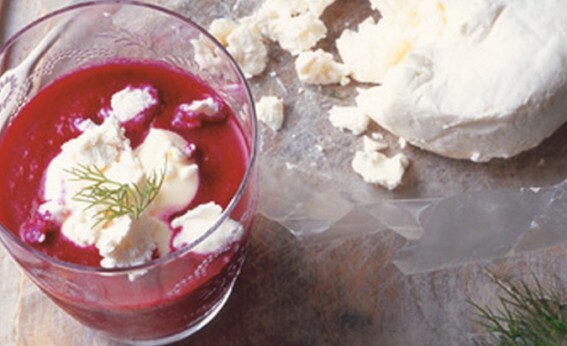 Bring to the boil, then simmer until the beetroot is completely tender. Leave to cool, then purée. Serve hot or cold with a dollop of soured cream on top and dill sprigs, then crumble the goat’s cheese and add some to each serving. Make the soup as above and garnish with soured cream, sprigs of dill and flaked leftover cooked salmon, or, if you have a piece of raw salmon, cut the flesh into tiny dice, moisten with a little light-tasting olive oil and lemon juice, add salt, pepper and chopped dill and spoon on to the soup along with soured cream.